Az Auto Graphics is an Internet & Mail order company only. We do not have a store front but we do offer mobile and on site installation service. 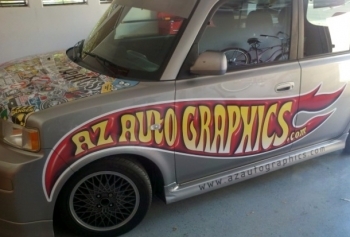 Specializing in custom vinyl graphics, since 2000. We have worked hard to earn an exceptional reputation from our unique designs and customer satisfaction. We are committed to building long term relationships and pride ourselves in the customer referrals we receive. Why choose us? Simple, we care about the quality and the over all look of your project. Do you know that we round all the sharp corners on all of our side graphics kits .025 of an inch or more, so that it would last a lot longer under normal wear like a car wash.
Our customers and their satisfaction come first. Our team prides themselves on our excellent customer service. We are committed to keeping up with the ever-changing industry. We are also committed to our customers by helping them stay head and competitive in the current, and future market of the sign & graphics world.